Aart, J. v., Salem, B., Rauterberg, M., Bartneck, C., & Hu, J. (2008). Designing for Experience: Arousing Boredom to Evoke Predefined User Behaviour. Proceedings of the Design and Emotion Conference, Hong Kong. Abstract - In the light of Cultural Computing, this study influences user affect and behaviour by touching upon core values of Western culture. We created an augmented reality environment in which users experience a predefined sequence of emotional states and events. This study concerns two typically Western drives: boredom and curiosity. We specifically address the arousal of boredom, a mental state characterized by a heightened drive for exploration, making it easier to guide people in their decision making. Based on psychology literature, we introduce general design guidelines for arousing boredom. 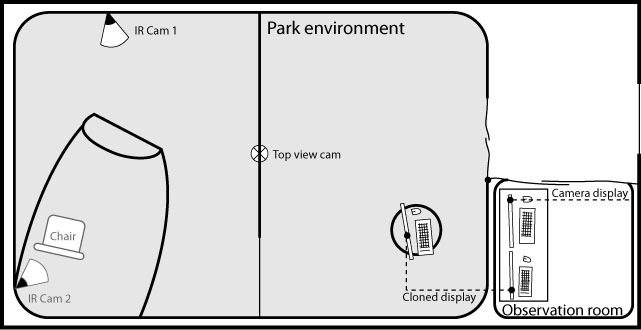 We report on the design of the augmented reality environment, the experiment effectively arousing boredom and on the redesign of the environment based on the experimental results. Recently, a new paradigm for Human Computer Interaction (HCI) has emerged: cultural computing. This paradigm finds its roots in Kansei Mediation, a multimedia combination for both conscious and unconscious communication of information on emotions, feelings, perceptions and experiences (Nakatsu et al., 2006). Cultural computing acknowledges the values and attributes of a culture and uses these in an Augmented Reality (AR) the user can engage with. This is done in such a way that the experience of the interaction touches on core aspects of his/her own culture (Rauterberg, 2006). We created project ALICE, inspired by the narrative ‘Alice’s Adventures in Wonderland’ (Carroll, 1865). The deconstructivist nature of Alice’s adventures challenges the Western linear and sequential reality (Rauterberg, 2006), it questions cultural values such as logical reasoning and causality. Through selecting parts of Alice in Wonderland, we identified important and powerful values of Western culture and tried to create a mapping between these values and human computer interactions. Project ALICE is an AR environment in which the user can experience these selected parts of the story by taking the place of Alice. The present study concerns the first part of the story, Stage 1, in which Alice is lured into the rabbit hole after a sequence of events and mental states. The story tells us that at first Alice was sitting in the park and felt very tired of having nothing to do, she was bored. After the White Rabbit ran by her with his unusual appearance and in a hurry to get somewhere, Alice was ‘burning with curiosity’ and ran after the rabbit (Carroll, 1865). Both boredom and curiosity are powerful drives in Western society and the focus of our research is to offer the user a chance to experience and engage in the same sequence of emotional states. We explore how behavioural aspects can influence user affect and decision making. We design for experience, to guide user behaviour by arousing a specific emotion whilst avoiding explicit instructions, signs or orders. From a broad perspective, emotions can be classified as an affective state together with moods, sentiments and personality traits (Desmet, 2002; Frijda, 1986). It is evident that humans use emotions to guide reasoning and decision making, consider for instance intuition and gut feeling. But the influence of emotions goes beyond intuition. Literature (Damasio, 1994; Isen et al., 1993; LeDoux, 1996; Salovey & Mayer, 1990) reports interplay between our emotions, memory, rational thinking, decision-making and behaviour. Within this perspective we try to trigger user behaviour through inducing user affect. First, we will help a misconception out of the way: boredom is not characterised by a state of low arousal like sleepiness. On the contrary, a bored human being is agitated and restless; he can even be emotionally upset. Berlyne (1960) discusses the causes of boredom and states that a lack of arousal potential (sensory deprivation) or predictable signals (monotony) both lead to boredom. Later, Glicksohn (1992) found that an overload of stimuli can actually have the same results as sensory deprivation. Berlyne (1960) identified several variables that can affect arousal and thus have to be reckoned with in order to arouse boredom. Firstly, he points out the intensive variables, which define the intensity of a stimulus (e.g. size, chromatic colours and high-pitched sounds). Secondly the affective variables, or emotional stimuli: human beings tend to search for emotional experiences and excitement. Thirdly he categorized stimuli that are for instance surprising, incongruous, strange or complex as the collative variables. 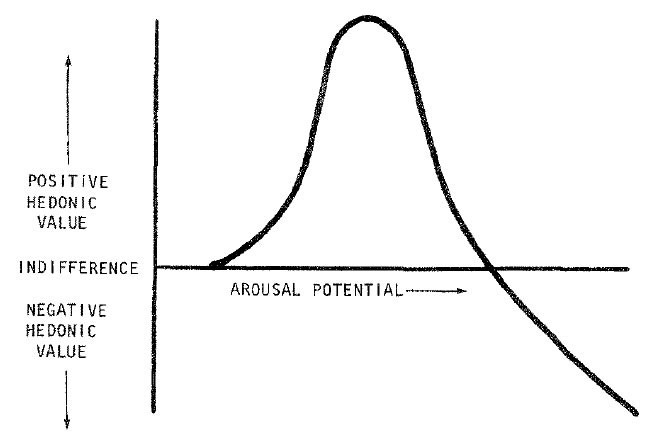 In addition, he found that the amount and intensity of arousal potential influences ones affective state according the Wundt curve (see Figure 1). Another area regarding boredom is the phenomenon of waiting. Waiting mainly results in uncertainty and anger and the experience of the wait is influenced by its commonness, duration, degree of occupied time and the users’ expectation (Maister, 1985; Taylor, 1994). And finally, “boredom results from being attentive to the passage of time itself” (Maister, 1985, quoting William James). A future experiment will be aimed at evoking curiosity in a state of boredom. Therefore we already consider curiosity arousing aspects in the design of Stage 1. Curiosity is a state in which one’s interest is heightened, leading to exploration; a vital motivation in learning and knowledge gathering. 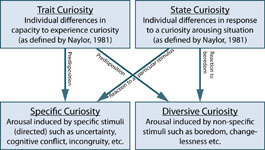 Berlyne (1966) differentiates between two types of state curiosity. The first is epistemic curiosity andis a result of intellectual uncertainty, it drives people to specific exploration (e.g. to acquire knowledge by asking questions). Perceptual curiosity on the other hand, is aroused by new or unusual stimuli, motivating diversive exploration (e.g. attentive listening), see Figure 2. To arouse one’s curiosity, we have to consider Day’s Zone of Curiosity (Figure 3). 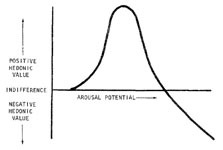 The tonus level indicates one’s general state of arousal, showing that an increase in arousal is desired. Remember that boredom too, works through a state of high arousal and can thus induce diversive curiosity (Day, 1971) and result in explorative behaviour. 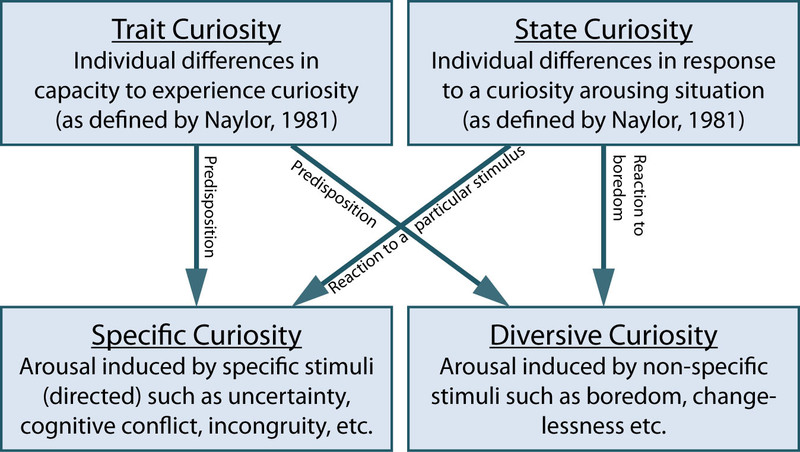 To summarize, Figure 4 visualizes how both diversive and specific curiosity are aroused. 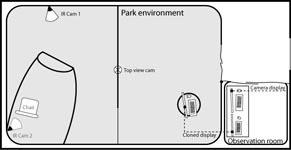 After the user entered the park environment (Stage 1) unaccompanied, either the absence or predictability of incoming stimuli results in boredom. As a result, epistemic curiosity is aroused. At that time, an extraordinary White Rabbit enters the scene, triggering specific curiosity as well. Before the user gets the chance to take a good look at the rabbit, the rabbit quickly proceeds to the rabbit hole. The user is left with unanswered questions and unsatisfied curiosity, evoking exploratory behaviour. Therefore he follows the rabbit into the rabbit hole to find an empty chair awaiting him. After taking place, this chair will take him down the rabbit hole to the next stage. 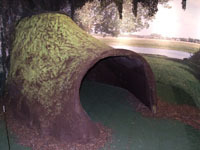 Stage 1 (Figure 5) is a park environment with artificial grass and a canvas print showing a park all around, illuminated from the back. 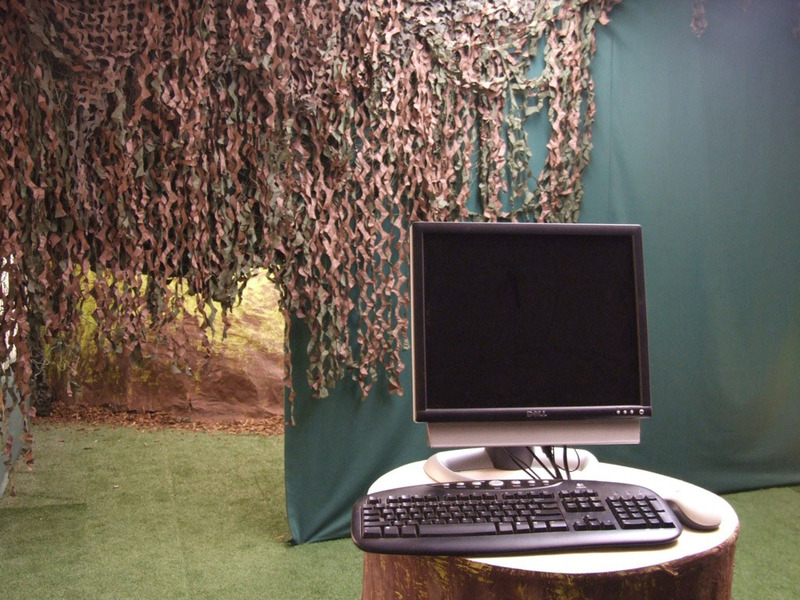 A tree trunk with a computer on top is set up for test purposes. 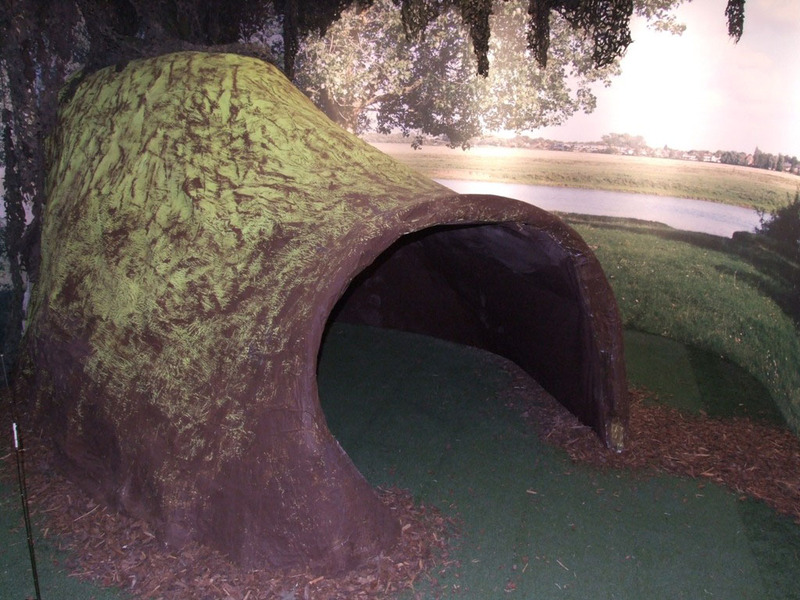 Located in the back is a big rabbit hole made of papier-maché (Figure 6). 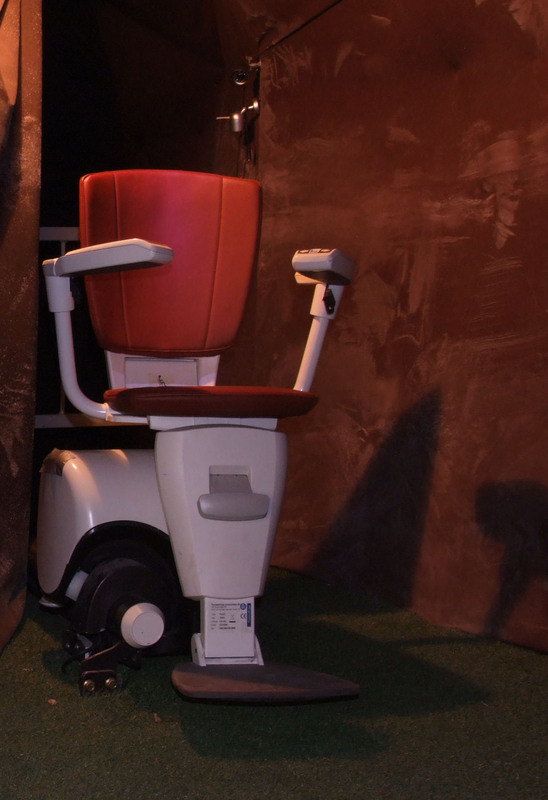 Inside the rabbit hole is an electronic chair, a stair lift (Figure 7). In the end, this chair will be the end goal of Stage 1, for it will take the user down the rabbit hole to the next stage. Since we intend to investigate the influence interactional and behavioural aspects of the AR environment, the main design decisions regard various event sequences and mappings between triggers and actions. These are realized as various test cases in the experiment and will hence be described in the study design in the subsequent section. Question 1: What is the most effective method for triggering boredom? Question 2: What is the required time to get someone in the state of boredom? A short and monotone monologue on the importance of healthy food is repeated over and over again. This repetition should make the audio stimuli very predictable. A clock is displayed on the computer screen, accompanied by a loud and high pitched ticking. This should make the user aware of the fact that time is passing; counting seconds, minutes, and so on. Placed in darkness, test participants are neither able to see the rich visual environment nor the rabbit hole. Cut off from the outside world, arousal stimuli are decreased to a minimum. Participants are placed in the stage, nothing is added or adjusted. The second variable was the influence of time on boredom arousal. We measured this by placing the participants in one of the aforementioned arousal conditions for a predefined period of 10, 20 or 30 minutes. Since there was no knowledge on the desired length of the wait for arousing boredom, these values were taken by speculation. Participants could only participate once, because the wait should not be expected. This led to a three by four factorial between-subject test design. The study population existed of 24 participants selected with a stratified random selection method out of a pool of students and teachers. Participants with prior knowledge of the ALICE project were omitted from the sample. Two tests were however aborted due to safety reasons, for the participants attempted to climb over the security gate inside the rabbit hole. These results were omitted from the analysis. This lead to a sample of 22 participants between the age of 17 and 26 years old, of which 14 males and 8 females, all either college or university students. Gender and age were evenly divided over the groups. The emotional state of participants was measured by applying two self reports. Firstly, the ‘Eigenschaftsworterliste EWL’ (Janke & Debus, 1978) or ‘List of adjectives’, measuring seven selected affective states: activeness, inactiveness (or lifelessness), extroversion, introversion, cheerfulness, agitation and dreaminess. The items were translated from German to Dutch by a Dutch German teacher (Aart, 2008). Secondly, the Melbourne Curiosity Inventory (MCI) (Naylor, 1981), specifically measuring state curiosity. To monitor user behaviour, video and audio recordings were made. Three aspects were monitored in particular: the time before the participant a) walks around, b) enters the rabbit hole, and c) walks out of the room. In addition, a step counter was attached to the participant’s belt as an indicator of physical exploration. 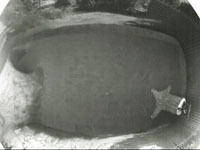 The video recordings have been used to count the amount of steps per minute. Participants entered individually and via written instructions they were asked to switch off their mobile phone and to follow the instructions on the computer screen. See Figure 8 for the experiment setup. It was also pointed out that video recordings would be made and that they were free to leave the experiment if they wanted to. There was no indication of how much time the experiment would take. But if the test subject asked, the experimenter would mention an indication of approximately 30 minutes. The experiments lasted for 10, 20 or 30 minutes, before and after which the self reports were acquired from the participants. During the experiment and depending on the test case, the computer display would either go black or display an analogue clock and the audio was automatically enabled. 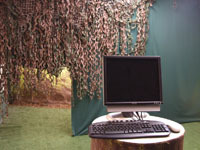 The participant was unable to control the computer since this functionality was disabled by disconnecting the USB cable backstage. During the experiment, all remarks and questions directed at the experimenter were neglected. 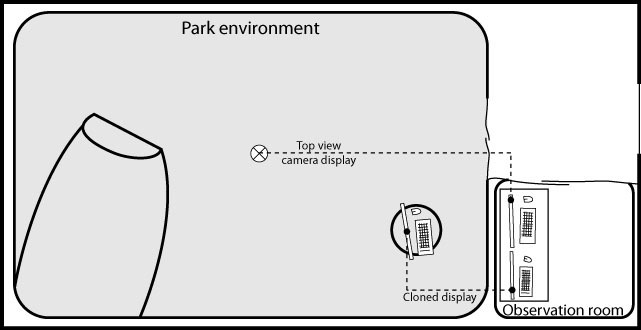 In case participants would walk out of the room and contact the experimenter, they were told “Everything that happens is supposed to happen the way it does, so please go back to the park environment.” In the analysis a distinction was made between participants walking out believing something was not working correctly (e.g. because the screen went black and controls were disabled) and participants walking out because they wanted to give up. The EWL items were summed up per scale and divided by the amount of items, resulting in a value between 0 and 1 for every measured affective state. The MCI exists of twenty 4 point Likert scale items. The item values ranging from 0 to 3 were summed up and divided by the highest possible total value, thereby converting curiosity to a value between 0 and 1 as well. The 0.05 confidence level was used for significance. 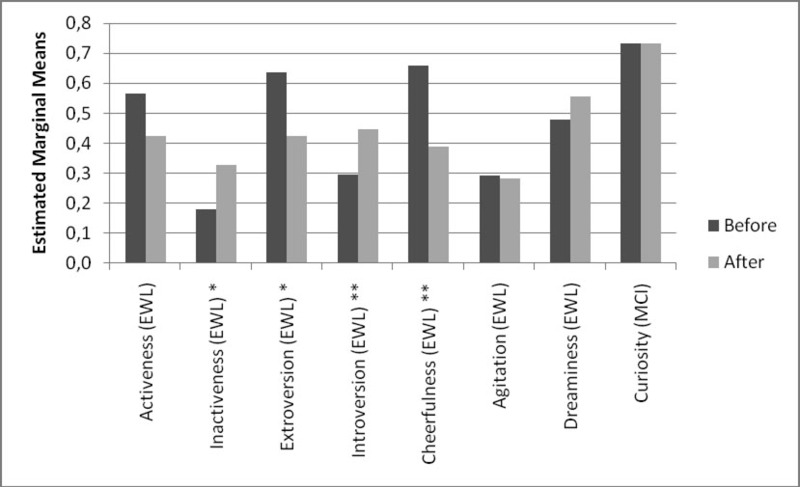 Overall, user affect changed significantly for inactiveness (0.147), extroversion (-0.214), introversion (0.151) and cheerfulness (-0.269), reported on in Table 1 and Figure 9. In general users reported to feel bored and at times disappointed that nothing had happened. Table 1 shows that with regard to the four arousal methods, no significant difference in the change of user affect was found. 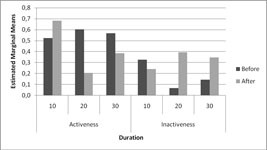 Regarding the duration of the wait, a significant decrease of activity and increase of inactivity was measured, reported on in Table 2 and Figure 10. Figure 9 : Overall change of user affect (n=22) * significant at ,05 level. ** significant at ,01 level. The total amount of steps showed no correlation with a change in user affect. It proved to be a poor indicator of exploration, since one can also explore in other ways that are not expressed in steps (e.g. mental exploration or crouching in the rabbit hole). As for the time measurements (i.e. 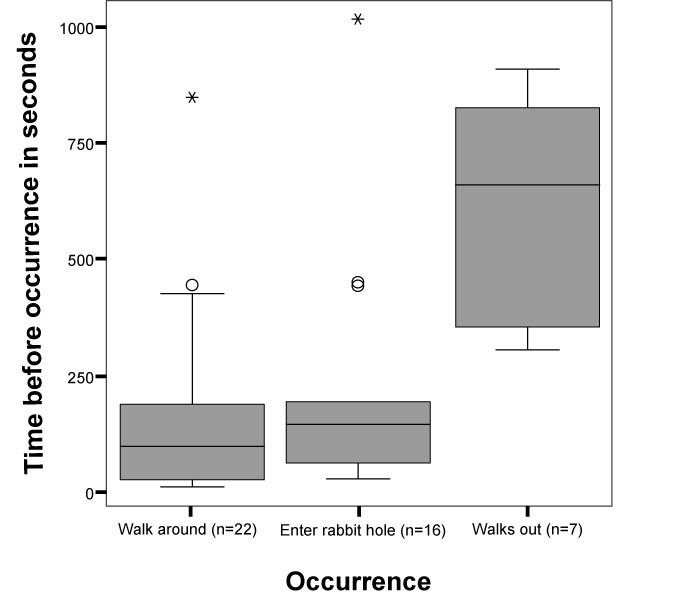 starting to walk around, entering the rabbit hole, and walking out of the experiment, see Figure 11): none showed significant correlation with user affect. Overall, a significant rise of inactiveness and introversion is observed, accompanied by a reduction of extroversion and a decrease of cheerfulness. Additionally, most participants reported to feel bored of having nothing to do. These are signs that boredom is in fact triggered. Based on the literature we expected a rise in curiosity. This rise did however not occur. We contribute this to the already high curiosity value measured before the experiment (0.733). 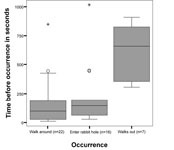 This initial value is most likely this high as a result of a) filling in the self reports in the visually stimulating park environment, and b) curiosity about the type of experiment. 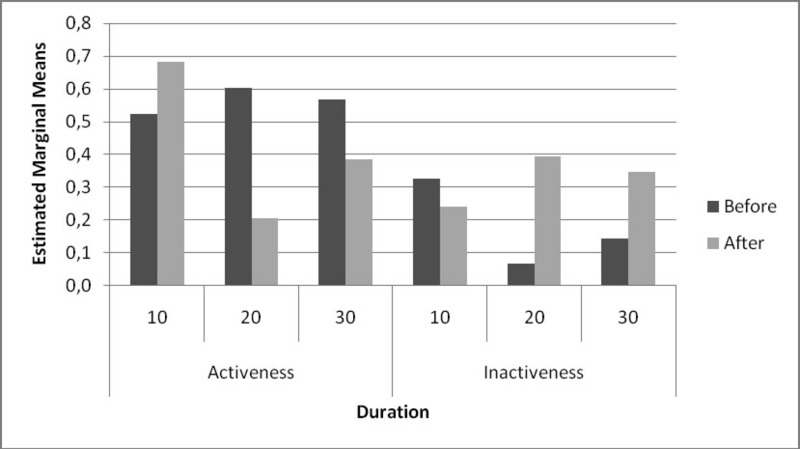 The only significant difference between the durations is found in activity and inactivity. Figure 10 shows that the largest difference is between the 10 and 20 minute wait. 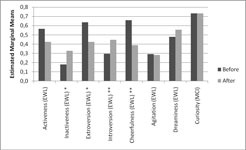 When comparing the overall change in user affect with the lack of differences between the durations, we conclude that introversion, extroversion and cheerfulness were already affected to the maximum before the 10 minute interval. This is also supported by the mean time before subjects walk out (approx 10 minutes, see Figure 11), which is a last resort for participants who feel bored and restless. In other words: user affect might already be influenced to the maximum possible value of this situation in the first 10-minute interval. The lack of difference measured between the arousal methods can have several causes. To begin with, the number of participants (22, 5 or 6 per condition) could be too small to measure the effect. Secondly, the difference in effects of the arousal types could not differ much, indicating all approaches are evenly effective. Or finally, the influence of the duration could mask the differences. The fact that even the control group showed no difference is probably due to the fact that even this group complied with two of the guidelines for arousing boredom. It is likely that differences would have been observed if the control group would have been given a task to occupy the waiting time. All things considered, the required time to get someone in the state of boredom is likely to equal less than or around 10 minutes. Although probably overshot, the 10-minute wait seems to be effective anyway. As for exploratory behaviour, the results were quite unexpected at times. For instance one participant attempted to climb over the security gate and down a pitch dark rabbit hole after 9 minutes whereas another subject simply laid down on the grass. This indicated that participants undertake a wide range of unpredictable activities as a result of waiting. To limit this variety, either the possibilities would have to be limited physically or participants would have to be kept busy with a boring repetitive task rather than a passive wait. Based on the conclusions of the experiment, we redesigned Stage 1 so that boredom can be aroused in an optimal way and participants are prepared for the experience of being lured into the rabbit hole by the White Rabbit. The first modification to the design is that unpredictable exploratory behaviour of participants will be limited by giving them a simple repetitive and occupying task. This should restrict them from satisfying their need for new incoming stimuli ahead of time (i.e. explore the environment before the White Rabbit enters the stage). It is important to find the balance between a task that is challenging enough to continue during the entire wait while it still arouses boredom and a need for new stimuli. We chose to take simple math exercises, adding and subtracting random numbers between 1 and 10. These exercises will be given via the computer, which will continue displaying new exercises for 10 minutes, since this is considered an appropriate duration to arouse boredom as explained in the previous section. 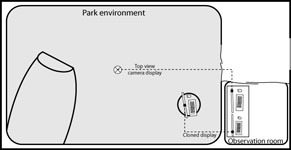 Another modification is in the form of a curtain in the middle of the park environment (see Figure 12), with a small entrance to the second part of the stage (see Figure 13). In the first place, this is done to limit the physical exploration by taking the rabbit hole out of sight. Secondly, this actually more closely resembles the original narrative, in which Alice had to crawl under the hedge to see the rabbit hole. Finally, two infrared cameras are added to the stage, to monitor participants who might enter the rabbit hole. A complete overview of the new design of Stage 1 is shown in Figure 14. Boredom and curiosity are important drives in Western society. From the perspective of psychological research we designed an AR environment that arouses the former of these emotions. We were able to study the interactional and behavioural aspects by using various approaches to design for this experience. 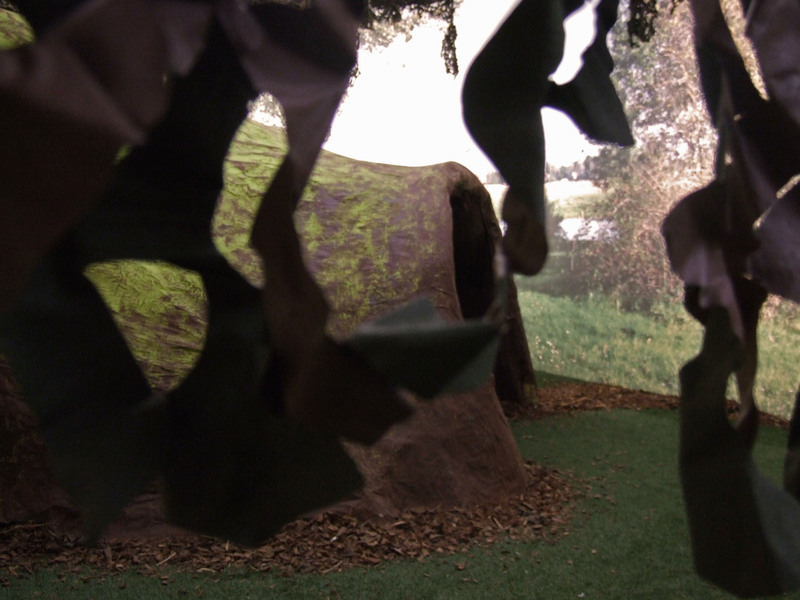 This environment was developed through an iterative design process in which the adaptations were based on outcomes of experiments and reflections on experiences. As far as we know of, this is the first study in which boredom is deliberately aroused in order to effectively guide user behaviour. This is an example of designing for experience, affecting users and thereby user behaviour. We have seen many different reactions of users and limited these through adapting the design of and events within the AR environment. A future study will take place in the redesigned environment and use these results in aiming for subsequently arousing curiosity as well. The guidelines, design decisions and practical experiences presented in this paper can be of use in developing human-computer interactions that reckon with cultural values and affective drives. This study touches upon core values of Western culture and arouses a mental state in people that allows us to guide them in their behaviour, for they experience an increased drive to explore and search for knowledge. Besides the planned study on arousing curiosity, future work could include more effective guidance of explorative behaviour through arousing emotions or a detailed study on the effect of individual arousal stimuli as presented in this paper. In such studies we envision the use of continuous emotion recognition methods over self reports, for this would probably provide more detailed results for specific stimuli. Moreover, this would enable an installation that is able to adjust its actions on the user’s affective state and personality traits such as boredom proneness. Our thanks go out to the many participants, who experienced agonizing waits. We are also very grateful for the sponsorship of the Department of Industrial Design of the Eindhoven University of Technology and the Microsoft Research Laboratory in Cambridge, UK. Aart, J. v. (2008). Escaping Reality - The creation of an affective experience (Project report). Eindhoven: Department of Industrial Design, Eindhoven University of Technology. Arnone, M. P., & Small, R. V. (1995). Arousing and Sustaining Curiosity: Lessons from the ARCS Model. Proceedings of the 1995 Annual Conference of the Association for Educational Communications and Technology, Anaheim, California. Carroll, L. (1865). Alice's adventures in Wonderland. London: Macmillan. Damasio, A. R. (2000). Descartes' error : emotion, reason, and the human brain. New York: Quill. Day, H. I. (1971). The measurement of specific curiosity. In H. I. Day, D. E. Berlyne & D. E. Hunt (Eds. ), Intrinsic motivation: A new direction in education. Ontario: Ontario Institute for Studies in Education. Day, H. I. (1982). Curiosity and the interested explorer. Performance and Instruction, 21(4), 19-22. Desmet, P. (2002). Designing Emotions. Ph.D. Thesis, TU Delft, Delft. Isen, A. M. (1993). Positive affect and decision making. In M. Lewis & J. M. Haviland (Eds. ), Handbook of Emotions (pp. 261-278). New York: Guilford Press. Janke, W., & Debus, G. (1978). Die Eigenschaftswörterliste EWL. Götingen, Toronto, Zürich: Hogrefe. LeDoux, J. (1996). The Emotional Brain. New York: Simon & Schuster. Rauterberg, M. (2006). From Personal to Cultural Computing: how to assess a cultural experience. Proceedings of the uDayIV - Information nutzbar machen, pp 13-21. Taylor, S. (1994). Waiting for Service: The Relationship between Delays and Evaluations of Service. Journal of Marketing, 58(2), 56-69.